Arena 43 in Kalyan Nagar allows you and your gang to play your favourite sport in an indoor setting. If you want to skip your monotonous gym routine for a day and want to do something fun instead to burn calories, hit up this multi-purpose indoor sports court in Kalyan Nagar with your buddies to play your favourite fun sport. 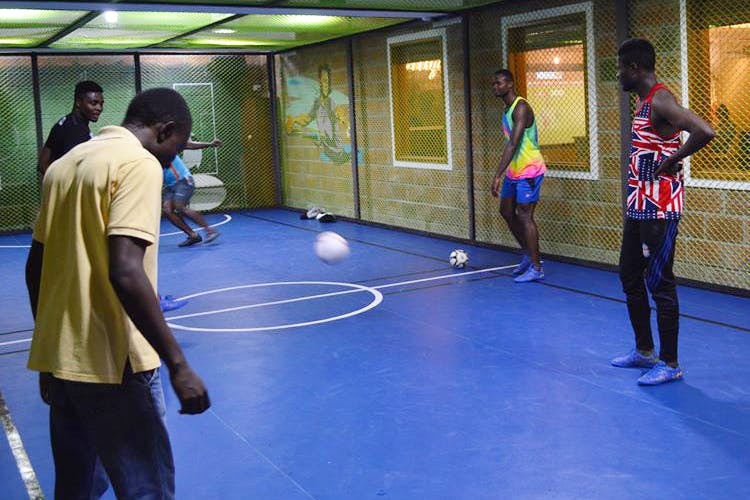 Be it football, cricket, futnet or our favourite dodgeball, Arena 43 will sort you out for just INR 700 for an hour. The court allows a max of eight people to play any game, however we would suggest, six people for a more fun experience. Those not into sports and just want to watch your peeps kill it on court? You can sit on the bench in true Anthony Martial style! Sorry, Manchester United fans, it's true! The Arena also rents out the space for other events such as birthday parties, workshops, artistic events such as open Mics etc. However, they would require to source their food from their in house café, Café Myodo. They also plan to screen popular sporting events in a proper stadium-style set up, so gear up to watch EPL, IPL and El Clasico here. The venue provides you with trainers and shoes for the duration of the game, which can be really unhygienic. We would advise you to carry your own footwear.